Apart from the much-covered spat between director Michael Bay and starlet Megan Fox, which ultimately led to her replacement with Victoria’s Secret model Rosie Huntington-Whiteley as the female lead, and star Shia LaBeouf promising things would be much better this time around, we haven’t heard too much about Transformers 3. The Bay directed trilogy-capper now has itself an official title, and it will be interesting to see how fans react to it. 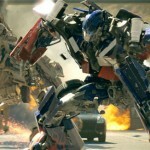 The movie will now be called Transformers: The Dark of the Moon, which ties to a trio of upcoming Transformer novels with similar titles, Transformers: The Dark of the Moon – Secret of the Autobots, Transformers: The Dark of the Moon – Autobots Betrayed!, and Transformers: The Dark of the Moon: Invasion of the Decepticons. The third installment also stars returning actors Josh Duhamel, Tyrese Gibson, John Turturro, and Hugo Weaving, and an impressive list of newcomers including Alan Tudyk, Ken Jeong, Patrick Dempsey, Frances McDormand and John Malkovich. Transformers: The Dark of the Moon hopes to close out the trilogy with a much stronger story and less cheesiness. The movie is currently aiming for a July 1, 2011 release date.